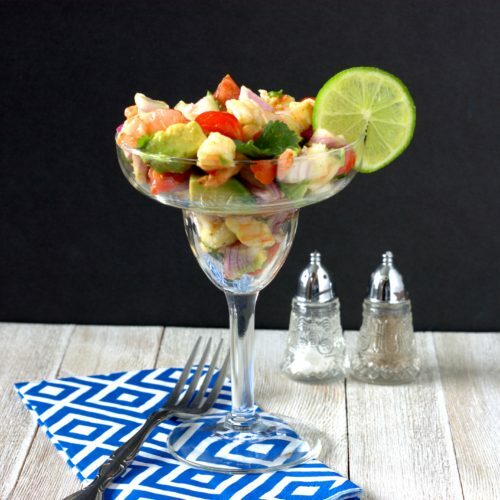 One of the favorite dishes in my house that sets the tone for a beach vacation is shrimp ceviche. It is light, has vibrant flavors, and looks pretty plated to boot. 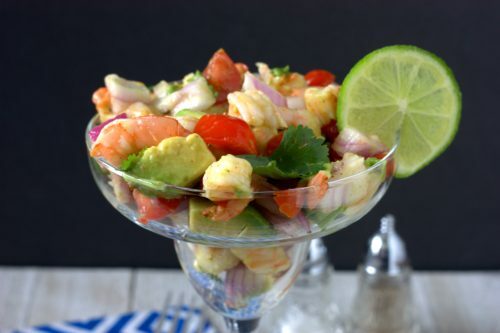 In traditional ceviche, the fish is cooked using an acid, such as lemon juice. My recipe uses pre-cooked shrimp to be able to make the dish quickly and appeal to a broader audience. 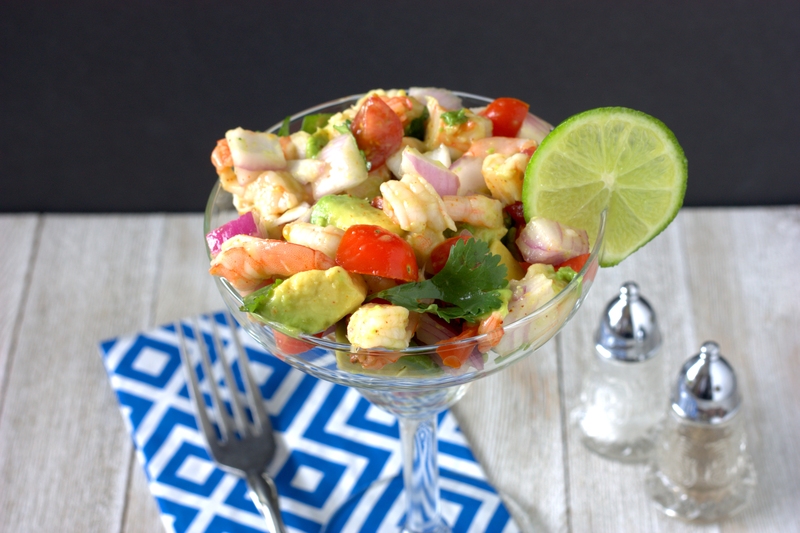 The Simple Shrimp Ceviche is loaded with baby tomatoes, red onion, avocado, and cilantro in addition to the generous amount of shrimp. The final touch is a bit of lime juice, salt, and fiesta lime seasoning. 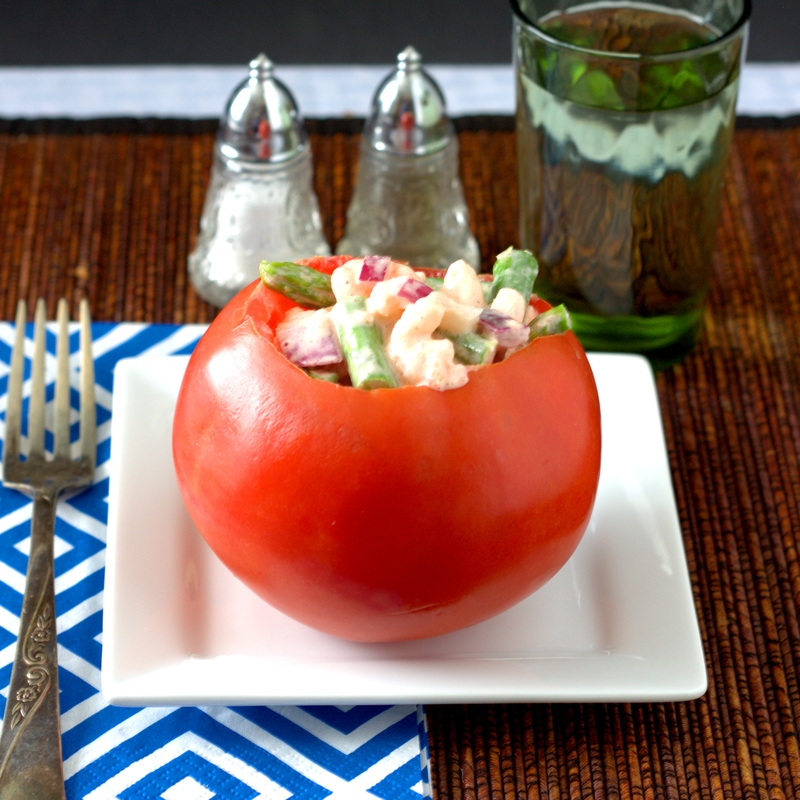 The resulting dish will sure to become a summertime staple in your house too! Chop the shrimp into bite size pieces and add to a large bowl. Add in the tomatoes, red onion, avocado, and cilantro. Cover with the lime juice, salt, and fiesta lime seasoning and stir to coat and mix evenly. Refrigerate until ready to serve. The summertime heat often begs for meals that require little cooking or are lighter fare. With that in mind I wanted to try a stuffed tomato this week. For the filling I chose to use a mix of asparagus, red onion, and shrimp for a delicious and colorful dish. The dressing was a mix of tomato, sriracha powder and mayonnaise, which gave a nice kick to the filling. The result was a simple yet satisfying dinner. What summertime meals do you enjoy? Bring 2 cup of water to a boil in a medium sized sauce pan. Blanch the asparagus for 3 minutes, then remove and place in ice water. 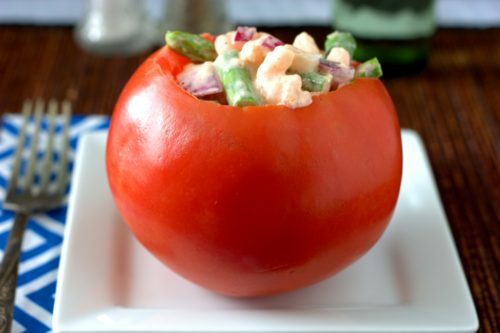 Remove the centers from the tomatoes, reserving about ½ lb of the scooped out tomato for the sauce. Add the reserved tomato to a food processor, along with the mayonnaise, salt, pepper, and sriracha powder. Drain the asparagus and add to a large bowl along with the shrimp and onion. Pour the sauce over the shrimp and stir to coat. Stuff the tomatoes with the shrimp mixture and serve immediately.